Greenwood, David R.. "British Columbia Eocene Fossils". The Canadian Encyclopedia, 20 June 2017, Historica Canada. https://www.thecanadianencyclopedia.ca/en/article/british-columbia-eocene-fossils. Accessed 19 April 2019. Palaeontological and geological studies of these deposits go back about 130 years. These include work carried out by George Mercer Dawson in 1890 as part of his survey of British Columbia for the Geological Survey of Canada, with occasional research published in the 1920s and 1930s. 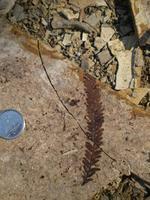 Fossil of the dawn redwood (Metasequoia), a common plant fossil found at all sites in BC (courtesy David R. Greenwood). 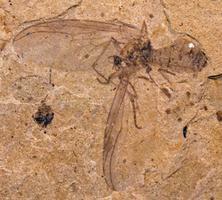 Fossil specimen of a march fly, a commonly found insect fossil in the Okanagan Highlands Eocene sites. The exceptional preservation of fossils in this region may be due to the post-mortem deposition of a bio-film of diatoms (courtesy Bruce Archibald). 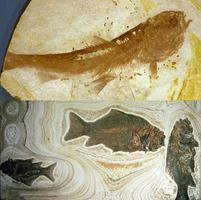 Eocene fish fossils from BC. Upper part: a young specimen of Eosalmo driftwoodensis, the oldest known fossil of the salmon and trout family, from the Driftwood Canyon fossil beds near Smithers. Lower part: Three fossil suckers (Amyzon aggregatum) from Horsefly. The fossils are preserved in annual sediment layers called varves, and each fish died during a different winter season (courtesy Mark V. H. Wilson). 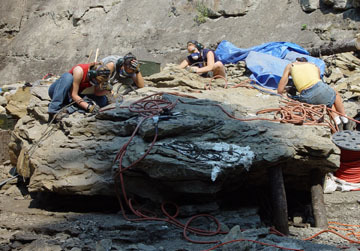 Paleontologists working at the Driftwood fossil site in 2008 (courtesy David R. Greenwood). Some 50 to 55 million years ago, during the early Eocene Epoch, British Columbia had a subtropical climate. In the interior from near Princeton north to Smithers, however, at an elevation of about 0.5-1.2 km, there was a cooler upland region called the Okanagan Highlands, where volcanic activity had created numerous lakes. The Okanagan Highlands in the early Eocene were home to mixed forests of conifers such as cedars, fir, hemlock, pine, spruce, and redwoods, and deciduous trees and shrubs such as alder and birch, cherry, elm, maple, beech, sassafras and sweetfern, together with ginkgo and rare palms and cycads. The floating fern Azolla covered quiet parts of the lakes, under which swam ancient salmon and other fish. Swarms of mayflies, scorpionflies (Mecoptera), green lacewings (Neuroptera), fungus gnats, and a myriad of other insects filled the air at a diversity normally expected in tropical forests. This ancient environment was similar in many respects to present-day deciduous forests of the US southeast. It combined a warm temperate upland climate with mixtures of plants of temperate deciduous and coniferous forests together with those normally associated with subtropical forests, such as the Chinese eucommia, golden larch, and golden raintree. Many of these warm-climate plants are today only found in southern China. Palaeontological and geological studies of these deposits go back about 130 years. These include work carried out by George Mercer Dawson in 1890 as part of his survey of British Columbia for the Geological Survey of Canada, with occasional research published in the 1920s and 1930s. Interest in the Eocene Fossils of the Okanagan Highlands region has expanded since the 1970s, continuing primarily in Palaeobotany, but also in palaeoichthyology (the study of fish fossils), palaeoentomology (the study of fossilized insects), and in palaeoenvironmental studies. The Horsefly locality is famous for its fossil fish; there, generations of fish have been preserved in successive seasonal lake varves. Studies by Mark Wilson of the University of Alberta revealed the inter-seasonal to multi-decadal ecology of the lake and the microevolution of the fish populations. Finding fossils in British Columbia's Okanagan Highlands is relatively easy, but many sites remain hidden under forest cover or high on valley rims. New sites are sometimes exposed by road construction. The shales are easily split and reveal beautifully preserved leaves, seeds, insects, fish and rare feathers and even rarer bird body fossils. Fossils from well-known sites sometimes turn up for sale in rock shops, although collecting fossils for commercial sale is no longer permitted in British Columbia. The fossil beds near Smithers are protected in the Driftwood Canyon Provincial Park where an interpretive display is provided, and fossils from the beds can been seen in the Bulkley Valley Museum in Smithers. 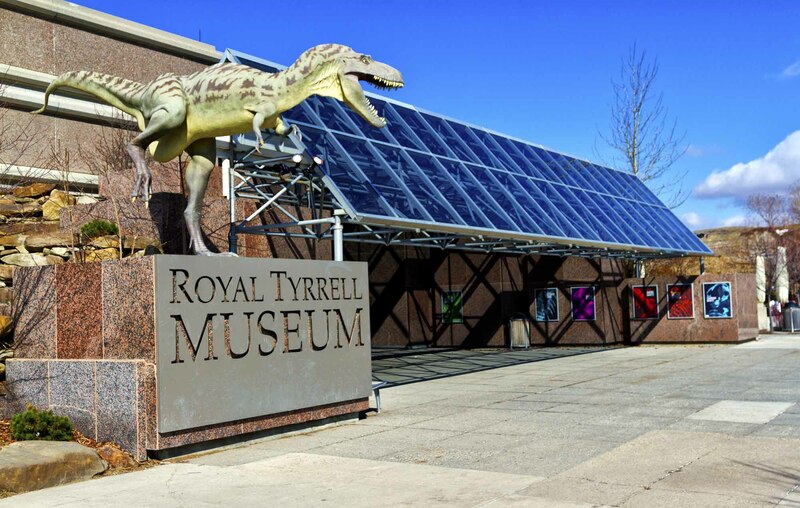 Significant collections from the Okanagan Highland Eocene fossil sites are also housed at the Canadian Museum of Nature in Ottawa and the Royal British Columbia Museum in Victoria. The exceptional preservation of the fossil insects in many of the Okanagan Highlands Eocene lake-shales may be due in part to the post-mortem deposition of a bio-film of diatoms (microscopic algae), which have recently been found to be preserved in these rocks in exquisite detail. 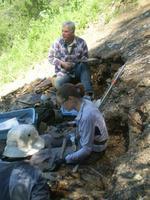 The Okanagan Highlands early Eocene lakes contain the oldest record of freshwater diatoms. In some fossil insect specimens, palaeoentomologist Bruce Archibald of Simon Fraser University has found that individual hairs on minute insect legs and colour patterns on wings may be seen. Near Princeton, silica-rich waters penetrated the Eocene shales and associated peats, turning the sediments into chert. When cut and polished, a chemical peel of the chert surface can be viewed under a microscope, revealing intricate anatomical details of the internal tissues of ancient swamp and lake-edge plants. Some of these fossils have been painstakingly pieced together by Ruth Stockey and her students from the University of Alberta to build 3-dimensional models of whole Eocene swamp plants. The fossil animals and plants preserved in Eocene lake-bed shales, and the Princeton Chert in British Columbia's Okanagan Highlands comprise a striking example of a cooler upland environment during the warmest interval in all of Cenozoic time. Palaeoclimate studies indicate that Mean Annual Temperatures (MAT) in the Okanagan Highlands during the early Eocene probably ranged from about 10 to 15º C, only slightly warmer than Kelowna's MAT today of about 8º C. But significantly, winters in BC in the early Eocene were mild enough to allow palms to grow, and average temperatures were no colder than 5º C compared to -4º C today. New studies of the frequency of leaf stomata (pores that are used for gas exchange) on ginkgo leaves, a sensitive indicator of past levels of carbon dioxide in the atmosphere, indicate that this greenhouse gas was at twice the levels present in the air today. The fossils of British Columbia could therefore contribute to our understanding and ability to foresee the impacts of global warming on Earth's ecosystems. See also Palaeontology; Fossil Animals.